We plowed along bravely for a week or more, and without any conflict of jurisdiction among the captains worth mentioning. The passengers soon learned to accommodate themselves to their new circumstances, and life in the ship became nearly as systematically monotonous as the routine of a barrack. I do not mean that it was dull, for it was not entirely so by any means--but there was a good deal of sameness about it. As is always the fashion at sea, the passengers shortly began to pick up sailor terms --a sign that they were beginning to feel at home. Half-past six was no longer half-past six to these pilgrims from New England, the South, and the Mississippi Valley, it was "seven bells"; eight, twelve, and four o'clock were "eight bells"; the captain did not take the longitude at nine o'clock, but at "two bells." They spoke glibly of the "after cabin," the "for'rard cabin," "port and starboard" and the "fo'castle." At seven bells the first gong rang; at eight there was breakfast, for such as were not too seasick to eat it. After that all the well people walked arm-in-arm up and down the long promenade deck, enjoying the fine summer mornings, and the seasick ones crawled out and propped themselves up in the lee of the paddle-boxes and ate their dismal tea and toast, and looked wretched. From eleven o'clock until luncheon, and from luncheon until dinner at six in the evening, the employments and amusements were various. Continued next week. Tomorrow's installment from The Wonderful Wizard of Oz by L. Frank Baum. This travelogue cemented this rising author's reputation when it was published in 1869. 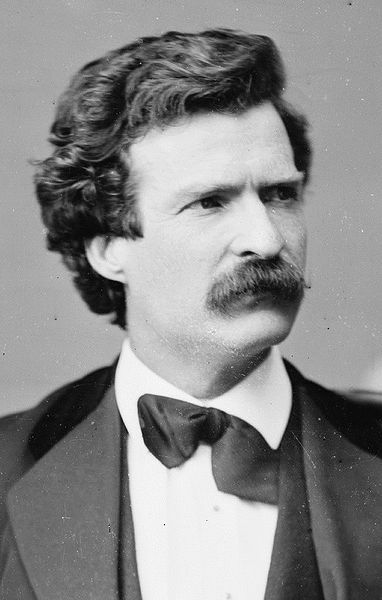 Photo: Samuel Clemens (aka Mark Twain) by Matthew Brady Feb. 7, 1871.